ELF required a website that could show off all of the great things they do in an easy to use content management system. They wanted to the ability to sell products online, so PayPal buttons were added to an online shop page so that they could sell their knitted ducks and other types of merchandise such as polo shirts and teddy bears. This was all developed in the content management system Drupal – this system allows for further and more extensive development much more easily. Our designer created a bright, clean design with great grid layouts for internal pages so that content can be browsed and found quickly and easily. 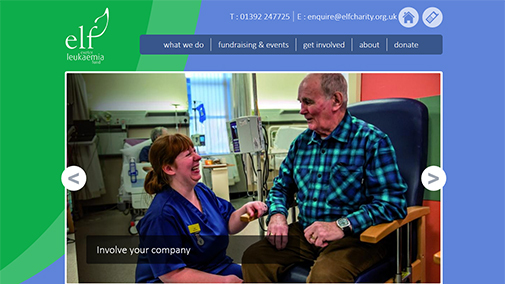 The ELF team can add charity shops to their website, different way people can get involved and help the cause, as well as news that is happening at the organisation. The website is also responsive, which means it will display perfectly for users on devices such as smartphones and tablets. Have a read of our blog about the ELF website development and what the ELF team said about our work.